Download the second book of Israel Shamir's essays, Our Lady of Sorrow. It contains his spiritual essays, the stories of Iraqi War and the developments in Palestine, including The Wall, The Shadow of Zog and Apocalypse Now. IsraelShamir.net is where you'll find the news and critical information on Palestine, Israel the Middle East and the United State's 'War on Terror' the Mainstream Media is too afraid to report. You'll also learn about the three faiths involved: Judaism, Christianity and Islam, not just the positive aspects but how people have twisted these faiths to justify killing, hate and terror. Between September 29, 2000 and the Summer of 2003, 2,237 Palestinians have lost their lives. This total includes 430 children who were killed; 228 kids were under age 15, and 202 others between 15 and 17 years old. During the same period, 435 Israelis also lost their lives. peace who defy the powerful propaganda machine of Zionism: its purpose to silence the truth through intimidation, fear, misinformation, libel, slander and the consistent application of psychological, financial and physical terror against those who protest its policies in any form. Zionists use the tools of propaganda against journalists, politicians, human rights activists, clergy and academia in the United States and abroad with impunity and the full support of many who have no idea what they are really supporting. IsraelShamir.net is dedicated to exposing the lies, manipulations and terror of Zionism and we are consistently targeted by their forces. We will not shut up, give in or compromise. 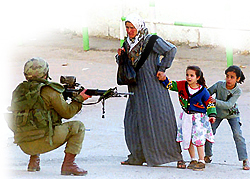 Too many lives, Palestinian, Israeli and now American and British troops are at stake. We need your help to continue researching, reporting and creating the tools of truth. Not another person needs to die. The War on Terrorism can end if people confront the cause of terror in the first place: oppression, ethnic cleansing, dehumanization and the other by products of fascism disguised beneath faith, victimization and false patriotism. The truth will end this, but first the truth needs to be heard. Here you can help and make a difference. Become part of the solution. The pen IS mightier than the sword. Help support freedom of speech and freedom of information outside the influence of special interests. Help save the lives of Palestinians, Israelis and now American and British Troops by helping us keep this vital resource of public debate and information alive, compelling and strong. There are many who don't want you to learn or hear both sides. Don't let them tell you what you are allowed to think, read and say! Your donations make it possible for us to bring you what most are afraid to whisper and even more terrified to admit. Your donations make it possible for us to help educate people. With truth, oppression loses its power. With knowledge peace receives its chance. All donors receive the new WORK IN PROGRESS by Israel Shamir THE PARDES as a token of our appreciation! & Thank you for being part of the solution!